Those of you who heard the Alva Noto remix of Bjork's 'Innocence' have already been given a preview of the rhythmic processes behind Unitxt, which aesthetically follows along similar lines to the Trans series of releases. Recorded over the past couple of years, this album's inception came about during the Raster Noton tour of Japan between 2006 and 2007, only to be finally revised and edited into its current form within recent months. Of all the rhythm-based music by Alva Noto, this latest batch probably marks the greatest levels of detail and elaboration. If an album like Transform was largely characterised by a strict and pristine approach to minimalism and subtlety, Unitxt presents a more complex and full-blooded exercise. The essential building blocks of the Alva Noto sound remain pared down and elemental, but there's something uncommonly visceral about Nicolai's compositional technique this time around, which while still familiar and unmistakably his work, sounds charged with renewed levels of ferocity and kinetic energy. Surprisingly, this album isn't entirely impervious to human interventions, and Poet Anne-James Chaton appears on eight-minute opening track 'U_07', offering a portrait of Carsten Nicolai in numbers and text, reading out the various pieces of information found in Nicolai's wallet, from invoices, business cards, notes and even credit card information. 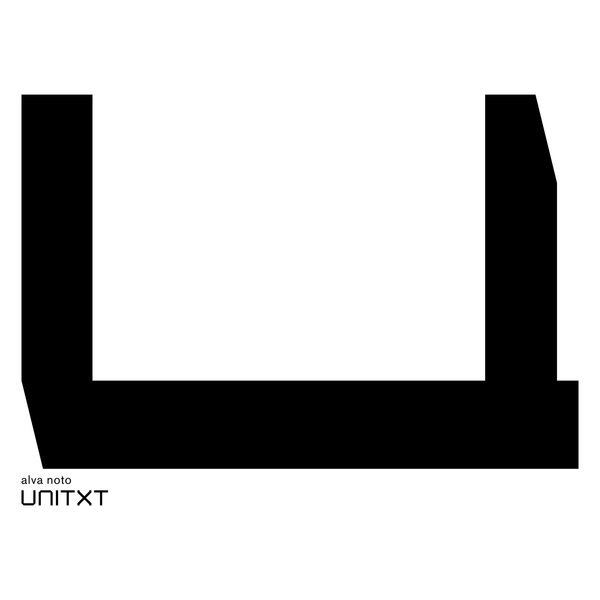 This theme of spoken numeric information is continued on 'U_08-1', in which Chaton recites a series of digits corresponding to the 'Golden Ratio', which conceptually is all very much in keeping with the kind of geometric-acoustic perfection suggested by Noto's intensely organised soundworld. The album is divided into two distinct sections: after an initial sequence of ten conventional recordings, the remaining sixteen audio tracks are occupied by various kinds of data having been converted into audio information, with software applications like Excel, Word and Powerpoint all reinterpreted as a raw stream of sound matter. The end result is surprisingly beautiful, and very much akin to the kind of radical, uncompromising digital experiments of Farmers Manual. There's a certain logical elegance to the fact that these sound files - sourced from programs you'd use everyday in an office - actually sound rather like the various mechanisms of technology you might have encountered over the years, from the rhythmic splutter of printers to the loading sounds of old 8 bit computers. When it's presented to you in this context, you really appreciate how chaotic, alien and how absolutely beautiful this continuous bombardment of data can be. Coupled with the recent Ryoji Ikeda Test Pattern CD, Unitxt presents a hugely absorbing perspective on our relationship with the information that's all around us, all the time. An amazing album - Hugely recommended.